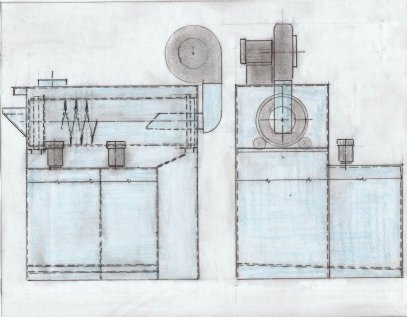 Below are drawings of a small continuous drum machine. The drum is fifteen inches in diameter, and fifty-four inches long. The overall footprint is approximately twenty square feet, including the hopper and dryer plenum. This unit can be fed from more than one direction. There is both a wash and rinse stage, as well as a blow-off fan to remove the majority of the water from the parts before discharge. Constructed from mild steel, with an option for stainless steel, this unit can be customized to meet almost any requirements for drum type cleaning. Customizing elements include, electric heat, electronic or manual level controls, wash stage oil skimmer (helps maintain tank solution), chip baskets, and a heated blow-off. This is an ideal machine for companies in the screw manufacture, or hardware manufacture industry. The size allows for a washer such as this near any and all production machinery. This can be supplied with a mating conveyor washer to clean the tote pans along with the hardware items.